Ideal for creating perfect circles, ellipses or oblong circles on any irregular flat or round surface. Can be used to lay out lateral intersections of different diameter pipes, or to project circles from 1-1/2 to 18 in diameter on flat surfaces intersecting at angles from 0 to 70 degrees from vertical. Attachments to develop larger diameter circles are available. 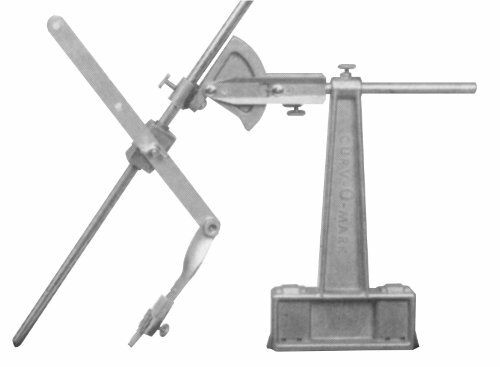 Features a protractor with sliding rod and an adjustable lever to lock in the specified layout. Strong, 20-pound pull magnetic base holds the Projector in position during layout. Durable web strap (included) holds the unit secure on non-magnetic surfaces and can be used on either side of the vertical column. The Projector is equipped with a soapstone crayon and also works with chalk, pencil or steel scribe.